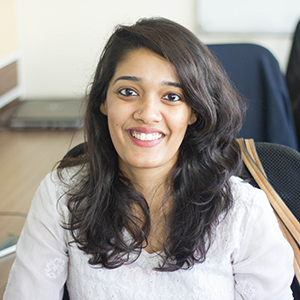 Rasikha is originally from Madras (now, Chennai) and lived there for 21 years until she moved to Bombay (now, Mumbai) to pursue her Master of Arts degree in Development Studies from Tata Institute of Social Sciences. She also holds a Bachelor of Arts degree in Economics (Honors) from Stella Maris College, University of Madras. Since 2013, she has been working as a development sector professional, first as a WASH consultant at NEERMAN where she was handling M&E projects and later as a CSR consultant with Samhita Social Ventures, where she is presently employed. She specializes in program evaluation, and has worked across sectors, including but not limited to education, WaSH, skill development, health and community development. Rasikha has published an article on the Forbes India blog on the importance of “measuring outcomes”, based on her experience evaluating CSR programs implemented in India. In her spare time, she volunteers at homes for the destitute, orphanage(s) and animal shelters. She enjoys debates and Model United Nations and organised and chaired MUN committees while pursuing her undergraduate studies. She also enjoys watching socio-political documentaries and movies. As a changemaker within the development space, Rasikha hopes to narrate stories of empowerment and progress through a socio-political and socio-cultural lens and hopes her time at Amani enables her to move forward in achieving her dream(s).